‘Tis the season for overnight breakfast bakes! 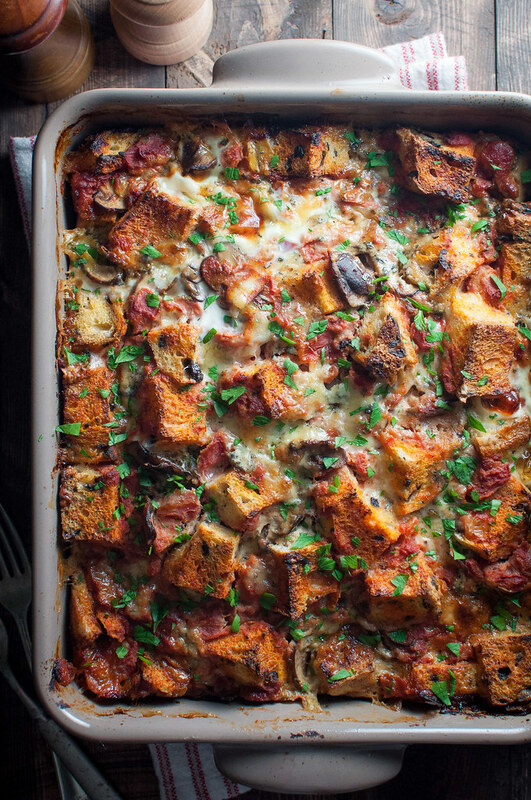 Like this one, which we might as well just go ahead and call what it is: bread lasagna. For a while there, breakfast casserole type things were out of my repertoire. Since I’ve been cooking in moderation (or sometimes not in moderation) with bread as of late, they’re fortunately back, making things like lazy weekend mornings (on the rare occasion they occur) and breakfast for a house full of guests that much easier. Plus, this Italian version features tomato sauce and leafy greens–red and green! Christmas colors! Coincidence? I think not. If you have any Christmas or holiday season brunch parties, 1) I’m jealous and 2) This is a great dish, whether you’re hosting or charged with bringing a carby contribution. Thanks to the greens, you can convince the wheat watchers that it’s semi-healthy. Really, it’s not, but it might be an entertaining debate. 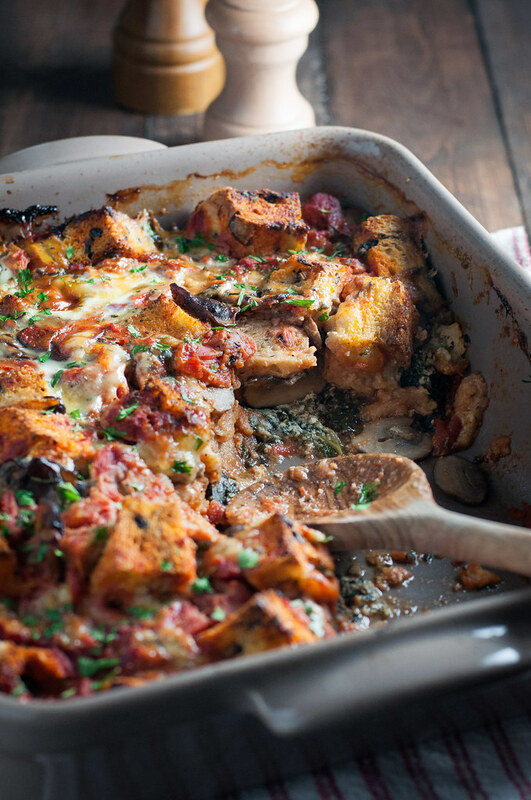 I don’t think anyone will argue about it being delicious, however, as they dig into a spongey, layered bread pudding with a generous dose of mushrooms and a bit of cheese to keep with the Italian theme. This morning, after a weekend filled with back-to-back celebrations of impending babies (not mine) and Christmas, I found myself being extra critical, starting up with the diet rules in my head to get me back on track after French toast bake and a bottle of champagne and queso dip and many wines and cookies–all the bad and tasty things. I did a little yoga, a handful of planks and pushups and squats, and then I remembered Adriene’s consistent message from all her yoga vids. Why can’t I show myself a little love and enjoy the things in life that are worth enjoying? Okay, maybe, I could have stopped one glass short at brunch, but like I said, it’s the season to indulge in cozy breakfast bakes like this one. Not to use it as an excuse to overeat, but to enjoy some salty and/or sweet homemade treats that were crafted with love. I plan to spend the first half of the week, before the celebrations commence again, not in regret, but savoring the little things. Soaking up the dreary weather, enjoying plenty of coffee, eating some juicy grapefruit for breakfasts, cooking up a curry with all the leftover veg in my fridge, and slowing down to cuddle with my hubs. As we hosted over 30 people last night for a Christmas nacho bar at our new house, I was pretty proud of myself for slowing down and enjoying a couple moments, holding more of said babies, scratching dog bellies, and trying to convince the kids to keep their fingers out of the sprinkles. I took care of my hostly duties, without worrying too much about the small mountain of dishes forming in the corner. That’s the exact approach I’m aiming for this week. It appears I started the gratin challenge at the perfect time. I had to move a few around to account for seasonality, but how perfect that the chapter should end with three indulgent overnight breakfast bake or bread pudding recipes smack in the middle of holiday season? Just two more to go! Next up is the polar opposite of this Italian spin, a kind of Southwest creation with lots of corn, scallions, cilantro, and a loaf of rye bread that I had in the freezer. Which reminds me, I maxed out the Italian flavors in today’s recipe by using an olive flecked loaf from Cobs. The olive bread is totally optional, but it was the cherry on top of this Italian treat. If you can’t find it (and don’t want to make this) but, like me, love that briny flavor, throw in a handful after you’ve sliced and patted them dry. After the challenge is all over, I’m not sure what’s next. I like having a cook through series on NCK, not only for the cohesive thread, but because it teaches me, and hopefully you, something new. In this case, it taught me all about gratins, i.e., all the amazing, comforting dishes one can make with a single vegetable and only a few other ingredients on hand. I can’t say that I have some big series planned for the new year, but I’m open to requests! Food, writing, photography–all have crossed my mind as a series topic, and we’ll see if they’re sufficient to sway me from my pile of cookbooks begging me to cook through their pages. 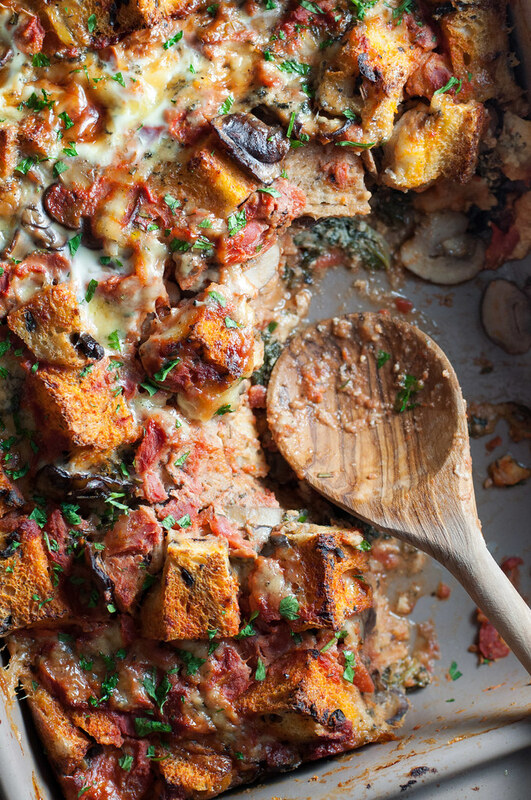 A festively bright breakfast bake full of classic Italian ingredients: crushed tomatoes, sauteed greens, browned mushrooms, and fontina cheese. The longer you allow it to rest before baking, the better it is. Rub a 9 by 13 inch pan all over with the cut sides of the garlic clove, the grease with the butter. Taste the crushed tomatoes and season with salt and pepper as if you were going to serve it as a sauce. Heat oil over medium high in a large skillet. When hot, add mushrooms and cook, stirring infrequently, until tender but with some liquid still in the pan, about 7 minutes. Remove to a bowl with a slotted spoon, leaving liquid in the pan. Season mushrooms with salt and pepper. Reduce heat to medium, add greens, and cook until wilted. For tougher greens, like kale, add a splash of white wine when almost wilted and continue cooking until wine is fully reduced. Remove from heat and season to taste. Coat the bottom of the baking pan with about ¾ cup of crushed tomatoes, followed by a layer of one third of the bread cubes. Top with all of the sautéed greens, half the fresh herbs, and half of the fontina. Make another layer, this time bread first (one third of the cubes), ¾ cup tomato sauce, all the mushrooms, and remaining fontina and herbs. Top with ¾ cup sauce, remaining bread, remaining sauce, and the blue cheese. Slowly pour the egg mixture over everything so any exposed bread is moistened. Give the pan a gentle shake and press everything down with the back of a spoon. Cover and refrigerate at least a few hours, or overnight. Bring almost to room temperature before baking at 375 (F) for an hour, or until slightly puffed, just set in the middle, and browning on top. Serve warm, topped with additional fresh herbs if desired. Keeps well as leftovers. There is nothing to stop you from having this for dinner. With the bread and eggs, it has the feel of a breakfast casserole, but it's delightfully satisfying and savory for a casual dinner. 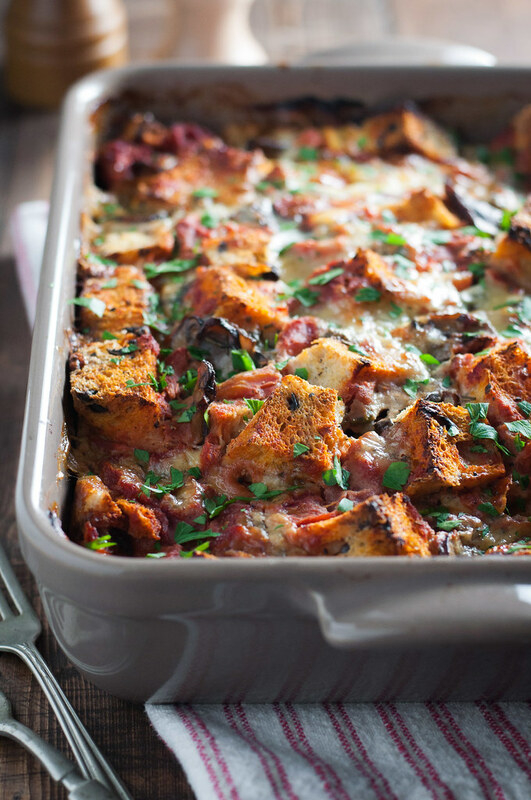 If you use vegetarian cheese, the recipe is vegetarian. I wouldn't recommend making this with most gluten free breads, unless you have one that's particularly sturdy. I haven't tested it with gluten free bread. Note: This page contains affiliate links. It does NOT contain sponsored content. Affiliate links (to products I recommend, on Amazon) offset my ingredient and website maintenance costs, so I can keep bringing you indulgent recipes like this one. Thanks!